From the fall of the statue of Saddam Hussein in Firdaus Square to the self-immolation of a Tunisian fruit seller to caravans of Humvees draped in ominous black flags—over the last 15 years, the world has watched the Middle East descend into chaos. 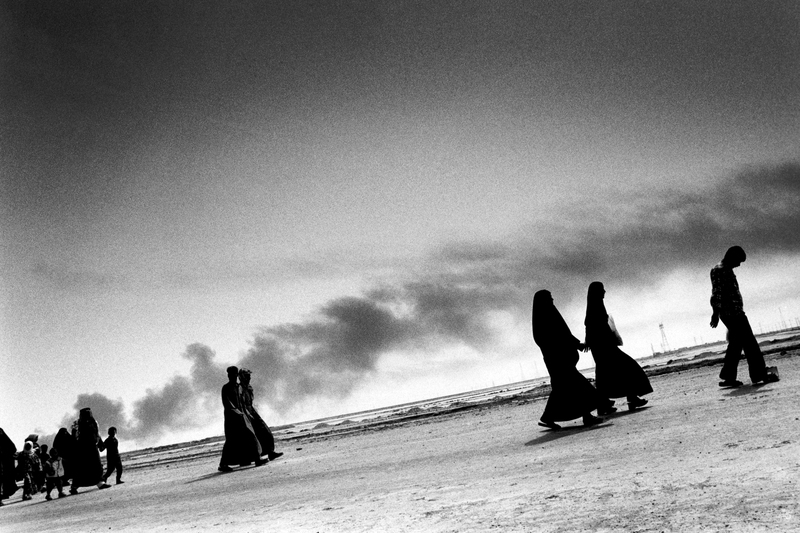 In this groundbreaking collaborative project, journalists Scott Anderson, Paolo Pellegrin and Ben C. Solomon chronicle the unraveling of the Middle East and the global and regional consequences of these seismic historical shifts. The project centers on grantee Scott Anderson’s book-length article—published as the sole contents of the August 14, 2016, New York Times Magazine—which analyzes the Middle East from the invasion of Iraq in 2003 to the rise of ISIS and the global refugee crisis. The narrative is anchored in portraits of six individuals of different ages, nationalities, socio-economic backgrounds and ethnicities. From a female activist in Egypt to a Syrian refugee in Germany, these individuals illustrate the human dimension of the collapse of regimes and the rise of terror and uncertainty across the region and the globe. Accompanying the piece are 20 black-and-white photographs by Pellegrin and a virtual-reality experience by Solomon. Solomon transports the viewer to the Iraqi city of Fallujah and the heart of the campaign against ISIS. His video can be viewed on The New York Times virtual reality app, which is free and available for download on iPhone or Android. To help educators and the public engage with this project, the Pulitzer Center has prepared comprehensive lesson plans, for secondary-school and university audiences, that can be found on the Lesson Builder page of the Pulitzer Center website. This project is underwritten by the Pulitzer Center's Catalyst Fund, an initiative aimed at fostering strategic partnerships between the Center and major news outlets to support work by freelance multimedia journalists on systemic global issues. The Catalyst Fund is made possible through the support of the John D. and Catherine T. MacArthur Foundation, the Kendeda Fund, and individual donors to the Pulitzer Center. "Fractured Lands" author Scott Anderson speaks with Bloomberg's Charlie Rose about his reporting. Pulitzer Center Grantee Scott Anderson discusses his new story Fractured Lands on PBS NewsHour. Poynter's Chief Media Writer speaks with Executive Director Jon Sawyer about the role of independent donors in media. The unraveling of the modern Middle East, from the Iraq War to the rise of ISIS and the global refugee crisis. A landmark collaboration with The New York Times Magazine.